It’s Follow-Up Friday: New Puzzles edition! And today, I want to spread the word about our latest Penny Dell Crossword App content! PuzzleNation Facebook followers got advance notice of this a day or two ago, and it’s time everyone heard! We have two new collections of crosswords available for purchase! The first is Collection 3, which offers 150 new puzzles across 5 puzzle sets: three under the Penny Press brand (Easy, Medium, and Hard) and two under the Dell brand (Easy and Medium). And all of these puzzles feature our Alternate Clue feature! And the second is our Winter 2014 Deluxe Set, which offers 30 Easy, Medium & Hard puzzles, as well as 5 unlockable bonus puzzles! The bonus puzzles are revealed after solving puzzles in the set, and to add to the challenge, there are no alternate clues! Both of these puzzle sets are available for in-app purchase right now! We’re thrilled to add to our library of quality downloadable content for you, and we can’t wait to show you what else is up our sleeves. 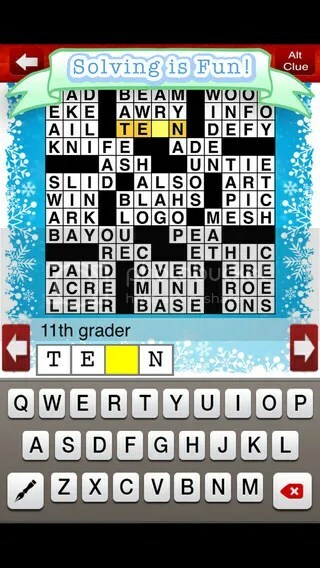 This entry was posted in Games, PuzzleNation, Puzzles and tagged crosswords, Dell Magazines, games, Geeking Out, Penny Dell Crossword App, Penny Dell Jumbo Crossword App, Penny Press, Penny/Dell Crossword App, Penny/Dell Jumbo Crossword App, Penny/Dell Puzzles, Pop culture, PuzzleNation, Puzzlin' fool by gmdirect. Bookmark the permalink.